Check printing and processing is governed by the Federal Reserve with guidelines authored by the American Bankers Association (ABA), the Check Payment Systems Association (CPSA) and American National Standards Institute (ANSI) standard X9. 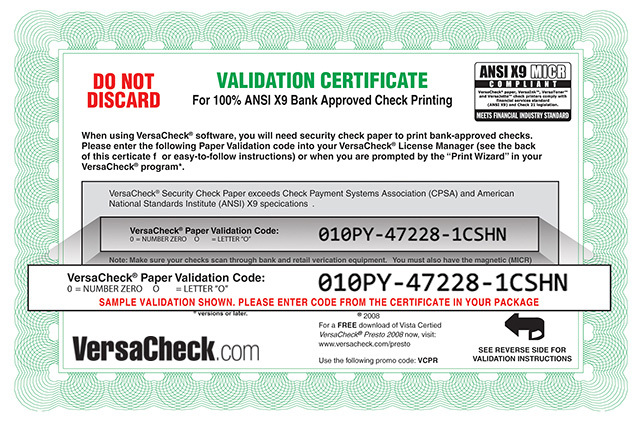 VersaCheck Security Check Paper and VersaInk/VersaToner MICR meet these standards and are Check Law 21 compliant. Failure to meet standards can result in check processing delays and per check fees due to manual exception handling and check scanning rejects. 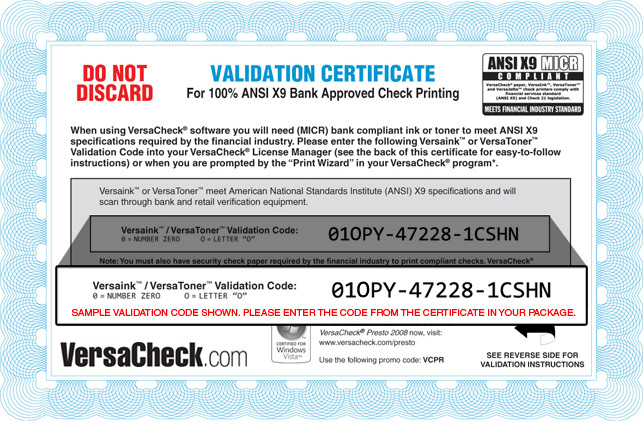 VersaCheck Validation verifies you have all the components necessary to print bank and retail compliant checks. Select the number of validation codes you would like to purchase. *Codes delivered by email and expire one year from activation. your VersaCheck software. Open VersaCheck and click on Tools\Manage Product Licenses\Product License Manager and type the code into the New Validation Code field and click Add Validation Code.